"Catching Fire," the second film in "The Hunger Games" trilogy, comes out in one year -- on Nov. 22, 2013. The cast is currently filming in Maui, Hawaii, and here are some photos from the movie-in-progress. 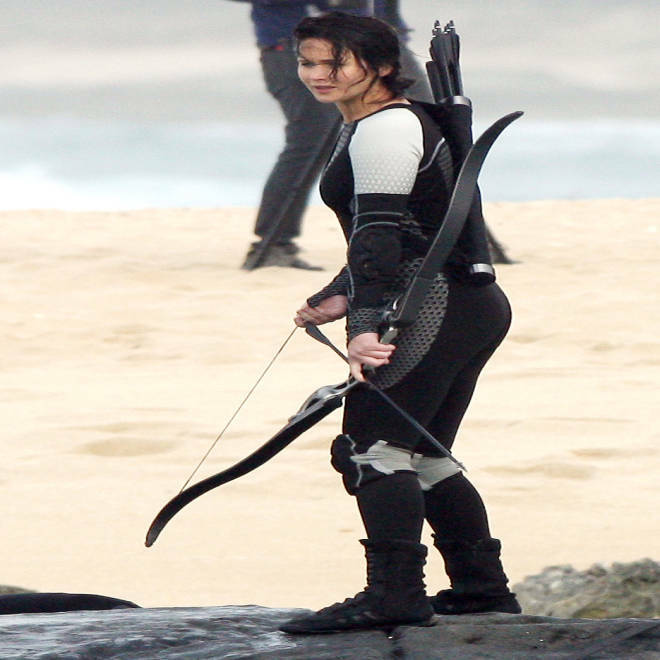 Jennifer Lawrence filming a scene from "Catching Fire" in Hawaii. Entertainment Weekly compared Lawrence's costume to "a wetsuit made out of a roller blade you owned in 1992." Lawrence takes up her bow. "Catching Fire" begins after Katniss has won the Hunger Games and must take a victory tour of Panem's districts with co-winner Peeta. But they aren't through fighting for their lives. The Quarter Quell -- aka, the 75th annual Hunger Games, aka "Hunger Games All-Stars" -- rears its ugly head, because we can't have two more books in the "Hunger Games" series with no Hunger Games. New characters will include Mags and Finnick. The photo above is believed to show Lawrence with Lynn Cohen, who plays Mags, an 80-something tribute. New characters, of course, will be introduced in "Catching Fire." Lynn Cohen, 68, will play 80-year-old tribute Mags, from District 4. She volunteers for the games to replace Annie, the troubled true love of the other District 4 tribute, Finnick Odair (played by Sam Claflin). Are you excited to see "Catching Fire"? Tell us on Facebook.